Kenton's Infotainment Scan: Gladwell and Rowland: how to be an FBI profiler - and psychic! Gladwell and Rowland: how to be an FBI profiler - and psychic! You can buy tickets on Ticketmaster for the low, low price of a million dollars (I exaggerate). You can like the Centrallia Facebook Page and be entered in a draw. 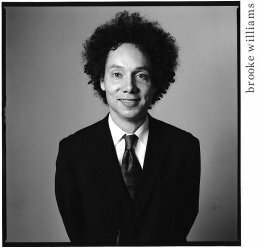 You can enter the Downtown Peggy contest by sharing your favorite odd or insightful tidbit from Mr. Gladwell. In other words: start with the last two, and drop the dough when you don't win! My favorite chapter from Gladwell's What the Dog Saw is "Dangerous Minds," in which Gladwell gives a shout-out to magician Ian Rowland and his book, "the Full Facts Book of Cold Reading" to debunk FBI offender profiling (the chapter appears in its entirety here in the New Yorker). The Rainbow Ruse - "the statement which credits the client with...a personality type and the opposite." Example: "You are introverted, but you can also be lots of fun." The Jacques Statement - "Named for the character in As You Like It, who gives the Seven Ages of Man speech, tailors the predictions to the age of the subject." Example: you say to someone in their 50s or 60s, "You sometimes think about your lost youth." The Barnum Statement - Named after everyone's favorite hero of the circus and public relations, you simply "make an assertion so general that anyone would agree." Example: "Your life has been crazy." The Fuzzy Fact - The "seemingly factual statement couched in a way that "leaves plenty of scope to developed into something more specific." Example: "I can see you're from Canada, possibly Manitoba. Could it be Winnipeg?" Fine Flattery - You can gain agreement by flattering those around you. Compare your client to "people in general" and then flatter them by suggested they're an improvement. Example: "Compared to most, you're very honest." The Psychic Credit - Credit your client with having an intuitive gift. Example: "You're have great insight and perception into (whatever)." Sugar Lumps - Get the client to embrace your psychic junk by giving them a pleasant emotional reward for doing it. Example: "You are more connected to the spiritual world than others - I get much stronger tarot impressions from you than from other clients." Greener Grass - We're all fascinated by the road not traveled. Compliment the client, and then refer to the path not traveled. Example: "I see you are very successful in the professional world. However, this life has also brought its penalties..."
The Good Chance Guess/Lucky Guess/Fluke - Good chance: "Your home address has a 2 in the number." Lucky guess: give a common name or initials, and wait for the client to accept it. Fluke: "Your name is Claudine." For some reason, these techniques also strike me as being of particular interest to advertisers. In next year's ad class: I start reading tarot cards.